Beatrix Davidoff and her family had just arrived at a home where a dog they were interested in adopting was being fostered. It had been a three-hour drive, and now they were about to meet the pooch. As they approached the front door, what they saw through the glass was terrifying. Read the story in Bea’s own words. The Williamsburg, VA, family had wanted a big dog so, on Petfinder, they had zeroed in on a Bullmastiff listed by American Bullmastiff Rescue – NJ Chapter. 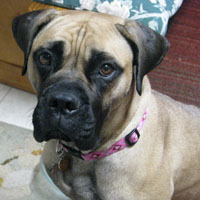 (A Bullmastiff can weigh up to 150 pounds.) But now Bea had a moment of doubt. The huge dog at the door “had this look on her face,” Bea says, “and I actually thought she was going to eat us. Her foster mommy opened the door and this beast came charging at us — charging at us to give us love and slobber us with kisses,” as it turned out. The beast was a pussycat. The love was further evidenced when the Davidoffs’ 13-year-old daughter was going through a rough time, and the one thing that brought a smile to her face was Hailey. “When Megan was sad, Hailey would lie next to her and kiss away her tears,” Bea says. Of course, with such a big dog, there have to be rules — like no sleeping on the bed, Bea says. But then, those big eyes make it hard to say no. So these days, Hailey not only sleeps on the bed but is one big huge lap dog as well. She herself is lapping up the love.